SPACES II from EASTWEST is the highly-anticipated sequel to SPACES I, the top-selling convolution reverb engine endorsed by top industry professionals which set a new standard in impulse recording techniques. 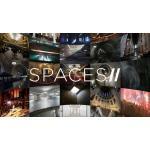 Produced by Doug Rogers and Nick Phoenix, SPACES II includes hundreds more new reverbs recorded in churches, concert halls, opera houses, catacombs, train stations, recording studios, and warehouses. It includes a new streamlined user interface, new control features, a vastly expanded collection of instrument specific reverbs, plus all of the reverbs from SPACES I, making SPACES II the most powerful and versatile convolution reverb on the market. A unique feature of SPACES II is the instrument specific reverbs that have been designed to take the guesswork out of instrument reverb selection. Only the SoCal hall was recorded using this method in SPACES I and it was so popular six locations with instrument specific reverbs are now included in SPACES II. How was this done? An ATC speaker array was created to emulate the sound projection patterns of each instrument or section. For orchestral halls, a recording was taken in the exact position an instrument would be on stage. A French horn fires its sound backwards against the back wall, therefore, an impulse for a French horn was created by firing the sweep tones from the middle to left rear of the stage, backwards and slightly towards the floor. 1st violin section recordings were taken by firing a series of speakers at an angle toward the ceiling, just like a real section, with a fifth speaker firing towards the floor to emulate the body of the violins. A choir shoots straight out from the back, a celeste or harp is usually way over to the side and a lot of that sound goes up giving you early reflections. Most soundtrack composers that use SPACES I consider the instrument specific reverbs from the SoCal Hall to be ground breaking. Set up a mixing template with unique reverb for the strings, brass, winds, percussion and choir and something magical happens. In SPACES II five more locations were added using this technique for a total of six. There are 324 instrument specific reverbs in SPACES II compared to 48 in SPACES I for a total of 372. It took a massive effort, but the results speak for themselves. From stunning concert venues like Abravanel Hall in Salt Lake City, Reynolds Hall in Las Vegas, and the War Memorial Opera House in San Francisco, to exquisite sounding churches like St. Patrick's and St. Dominic's, to unique and extraordinary sounding locations like catacombs and Union Station in Los Angeles and many more, the reverbs from these brand new spaces will inspire you and help bring your compositions to life with incredible realism. These are some of the best locations EastWest has recorded in and they will all perfectly compliment the locations from SPACES I.